picture on the right shows a tracking map of hurricane Katrina. How do people categorize and name hurricanes? In 1950 ,people named hurricanes by phonetic alphebet order. In 1953 , people had changed it to woman names . Now it is named in woman and men names . Hurricanes can be categorized by wind speed . The saffir-simson scale categorized hurricanes too . They are categorized by 1-5 ,5 being the worst . How does a hurricane get it formation and strength ? Hurricanes to be able to form , it need to be over warm oceans , at lest 80 of or more . Hurricanes get its main strength by contact with warm oceans . Hurricanes season is June 1st to November 30th . deaths in the hurricane . This hurricane had 175 mph . Hurricane cost 81 billion dollars . 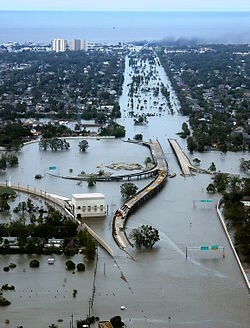 This hurricane hit mostly New Orleans Louisiana . This hurricane hit a lot of states in the south. Thank you for reading this article , come again to read another one !